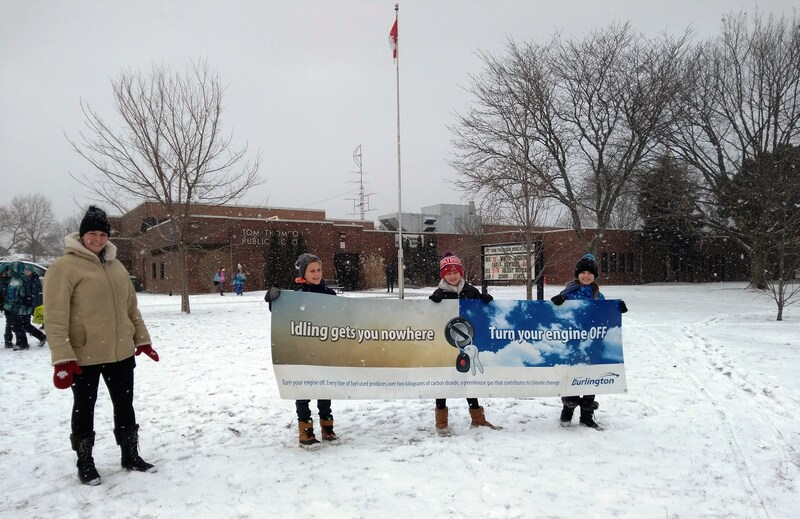 Eco Tigers club students at Tom Thomson Public School holding up a banner as part of their Idling Awareness Campaign. Image courtesy of A. Johnson. It’s hard to believe that another school year is about to begin. With students gearing up to go back to school next week, it seems like a good time to remind those of you doing school drop-off and pick up by vehicle to please turn your engine off while you wait. If “idling gets you nowhere,” then why do so many people idle? Is it the convenience? Or maybe you just never really thought about it. Whatever the reason, idling is not good for the environment, your vehicle or your wallet. Idling wastes fuel, which isn’t cheap these days, and releases emissions into the environment. It can also damage your engine’s components as an idling vehicle does not run at its peak temperature. Did you know that the City of Burlington has a one-minute idling limit for unnecessary idling? So, what is unnecessary idling? Well, if you’re waiting for someone with your engine running at school, the arena or the train station and we’re not in the middle of a heat wave, you’re idling unnecessarily and could be fined $120! 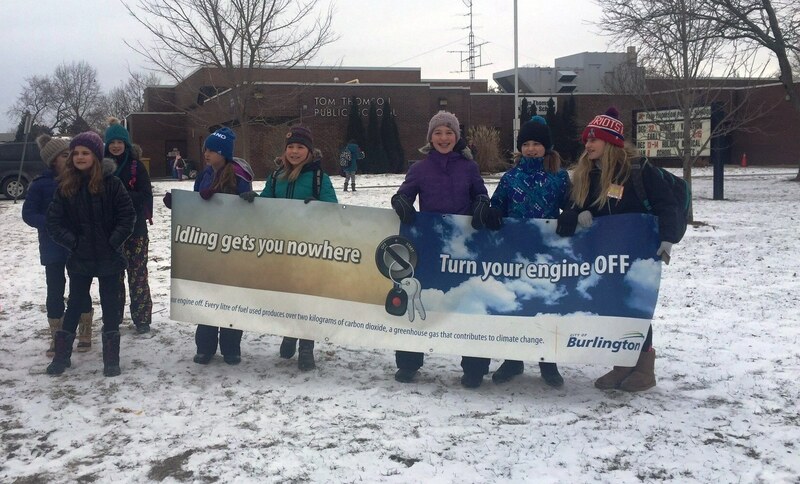 Burlington schools can get “idling gets you nowhere” posters, bookmarks and stickers plus borrow a large outdoor banner that can be attached to a fence on school property to remind drivers to turn off their engines. How much does this cost? Absolutely nothing! Contact me at environment@burlington.ca to get materials for your school. Tom Thomson students and their teacher running an Idling Awareness Campaign. Image courtesy of A. Johnson. Tom Thomson Public School is a great example of a local school using our materials to get the word out about idling. They ran another idle-free campaign last year. Ms. Johnson’s Eco Tigers spoke with drivers dropping off students at school about the importance of turning engines off. The Eco Tigers also wrote, starred in, directed and edited their own Eco Tigers film called “Anti-Idling Week.” Their film premiered at Tom Thomson’s annual Eco-Celebration. Congratulations Eco Tigers on another great campaign! We can’t wait to see what you have planned this year. If you want to make a difference like the Eco Tigers, I can help. Ask me for bookmarks, posters, stickers and/or a banner for your school’s idling campaign at environment@burlington.ca. If you’re parked or waiting in your car, truck or bus, turn your engine off because idling gets you nowhere!